MIAMI - A Miami man who had just installed a dashboard camera on his pickup truck ended up capturing a hit-and-run on video hours later. "Out of my peripheral vision, I saw this accident happen," Todd Fulcher said. "I looked up, and I saw this black car flying through the air." The crash happened Thursday morning on US-1 northbound at Southwest 22nd Avenue. 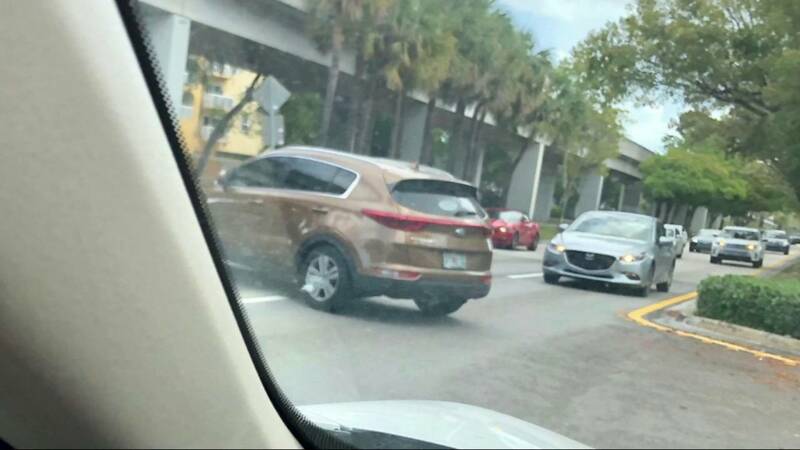 In the video, a copper-colored Kia Sportage SUV is seen darting out of the left turn lane before striking a black Mercedes, which is briefly sent airborne. The SUV then hits a red truck and drives off. Basil Binns II said he was behind the wheel of that Mercedes, heading to work after an appointment at the University of Miami. He never saw it coming. "I felt myself going airborne. I wasn’t sure if my car was going to flip, which was my biggest concern at the time,’ Binns said. Little did he know, two cars behind the SUV, was Fulcher and his dash cam. "As I was watching this I realized: 'Oh my God! I’m recording this!'" Fulcher said. Binns pulled over. He and Fulcher both noticed the driver of the SUV was leaving the scene. "It didn’t take long. They just decided, 'okay, I’m leaving,'" Fulcher said. "I land, and I see the car pulling off. And it was, so I was shocked," Binns said. On Friday, Binns took his 2004 Mercedes to an auto repair and said the damage is likely not worth repairing. He said he has pain in his arm but thankfully no broken bones. He also said he’s grateful for the people who stayed on scene, including Fulcher, who gave him that dash cam video. The video is now in the hands of Miami police detectives who are investigating. "I’m blessed to have been in that accident and not have worse injuries," Binns said.